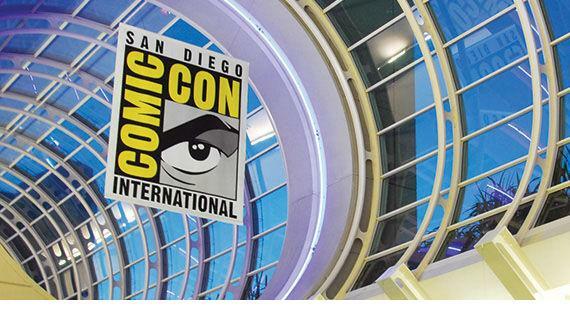 San Diego Comic-Con, one of the world’s largest conventions for toys, animation, movies, comics, and more, is getting ready to start up its annual exhibition at the San Diego Convention Center on July 24th, and toy companies from all over the world will be featuring exclusive merchandise only available at the 3-day long event. Toynami, an American-based toy company that has been creating specialty and licensed collectibles since 2000, has revealed three of their own exclusive toys for the event, and each one is worth keeping an eye out for! The first of Toynami’s releases is one of their most anticipated; the exclusive Glorious Golden Talking Bender figure is back! 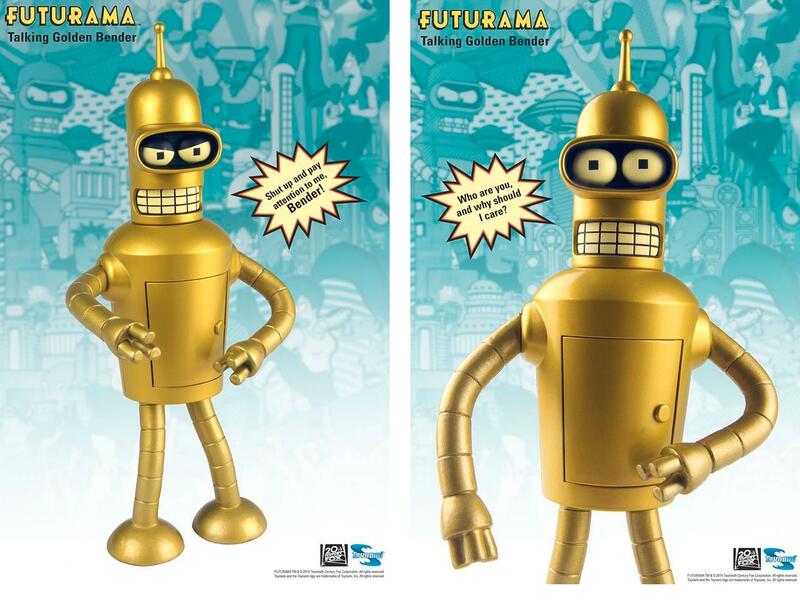 Originally released as a Toynami SDCC exlcusive back in 2006, the gilded robot has returned to celebrate the final episode of the Futurama cartoon series this past September. Standing at 9″ tall, Bender comes with three sets of swappable face plates, emulating a number of Bender’s iconic faces and emotions, and even features an opening chest cavity. On top of that, Bender features over 12 phrases voiced by John DiMaggio, whom lent his voice to the robot in the cartoon series! This piece, which will retail at $40 at the event, is limited to 1000 pieces. 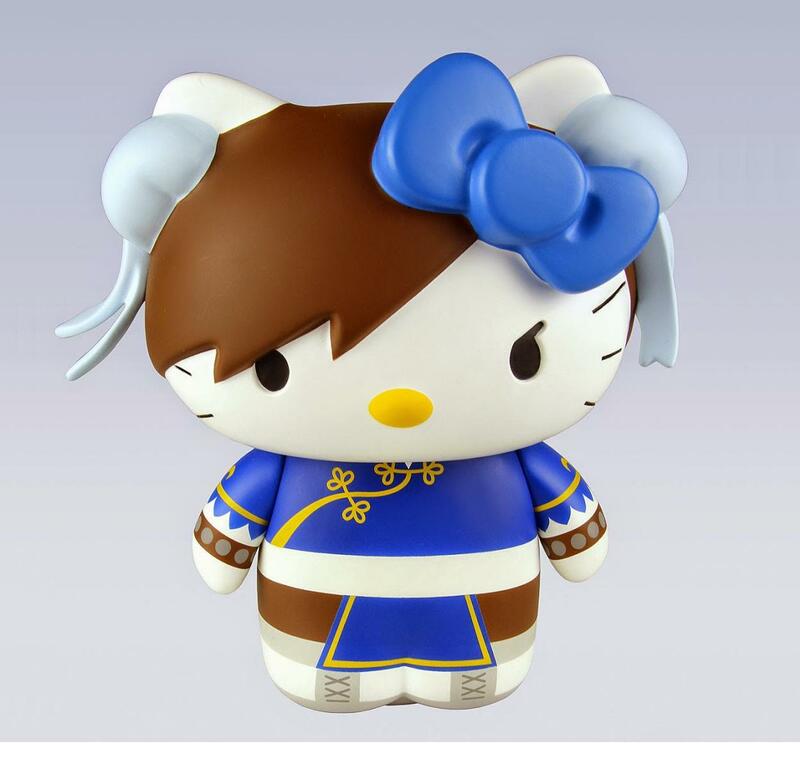 Next up is a collaboration with Sanrio and videogame company Capcom with the release of the Chun-Li Hello Kitty coin bank! With Hello Kitty celebrating her 40th anniversary this year, Toynami has paid homage to the character with this release, available exclusively at SDCC 2014. Standing at 8″ tall, this vinyl coin bank features the iconic kitten character, dressed as Street Fighter’s iconic character, Chun-Li, and features unique decals and sculpting in order to emulate her intricate costume. This coin bank will be released in a limited quantity of 1000, and will retail for $40 on the show floor. 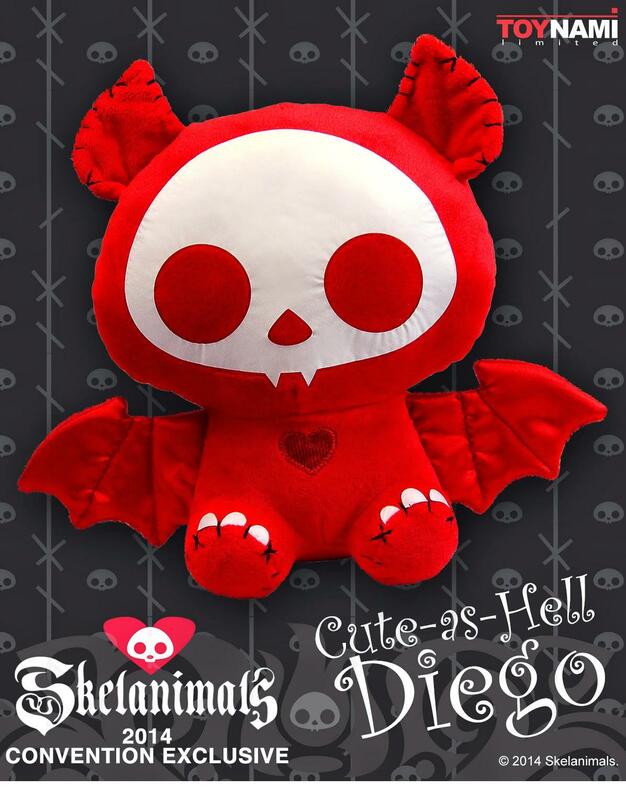 Finally, Toynami has announced the release of a brand-new exclusive Skeleanimals design for this year’s SDCC: The “Cute-As-Hell” Diego! This limited-edition fan-favorite design will measure in at 10″ tall, and come in a brand new velvet-red design. Limited to 1000 pieces, this exclusive release will retail for $20 at the show. With so many cool releases and exclusives announced for this year’s Comic-Con, make sure to stay tuned for news on releases, news, and more!